How do you “fill” the surface of a ball? The word used for “fill” the waters here is Strong’s # 4390 מָלֵא (maw-lay’): to fill. The precedence for understanding this word is thus established with the first usage of the word, where it talks about filling the water of the seas with fish. From this, we clearly see something (in this case, the seas) being filled, as in a container. Note also that the birds are to multiply “in the earth.” Wait. I thought birds flew “in the sky.” Is this a typo? No. The KJV gets this right, because in the Hebrew text, it reads: בָּאָֽרֶץ׃ and when the “בָּ” (bet) precedes the word it means “in”. Perhaps not coincidentally, the very first word we are introduced to in the Scriptures is this preposition: “In the beginning” – בְּרֵאשִׁ֖ית. It’s also quite interesting that it shows up in the description of where the sun, moon and stars were placed. 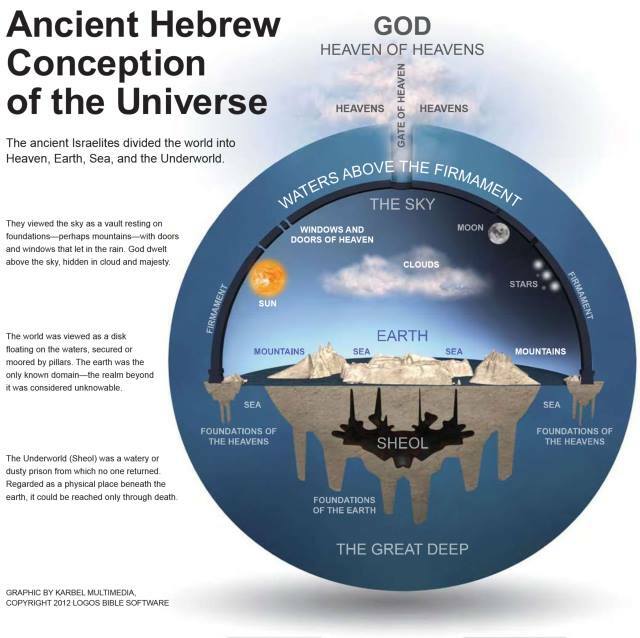 That’s right, they were placed “in the firmament” (בִּרְקִ֣יעַ) not outside and all around it as many a Creation scientist would have you believe. Thus Cain is in the earth the same way the birds are in the earth. They are in a firmament enclosed system. Genesis 1:28 And God blessed them, and God said unto them, Be fruitful, and multiply, and replenish (Strong’s # 4390 מָלֵא (maw-lay’) FILL) the earth, and subdue it: and have dominion over the fish of the sea, and over the fowl of the air, and over every living thing that moveth upon the earth. Genesis 9:1 And God blessed Noah and his sons, and said unto them, Be fruitful, and multiply, and replenish (Strong’s # 4390 מָלֵא (maw-lay’) FILL) the earth. Not quite sure how you can squeeze any of this into the notion of “filling” the surface of a ball though. Therefore, I suggest this is further proof of the fact that the Holy Spirit inspired Hebrew authors of Scripture subscribed to the cosmology depicted above by the scholars of Logos Bible Software. Thanks brother for sharing great short study!!! Like the reasoning, solid. Slightly off subject, but I love the progress of your God’s terrarium image. So true. Good points all. I love how His Spirit hovered upon the waters…again carrying through His protective language of His footstool, His throne above and His Spirit upon…covering us. We are in and are covered. I can imagine a ball also being filled but as you point out and so does science. Water isn’t curved.Filling up on a flat surface is much more logical.Snow globe style. Way to go with your Hebrew too!! Does the distance between points south of the Equator increase in a flat world vrs sphere? How far would southern South America be from southern Africa and Australia, going east and then west? Awesome food for thought. I love the bible. I enjoy watching and listening to all your topics on the bible. I am 62 years old and remember when in school them telling us we lived on a spinning ball. I thought they were all nuts. 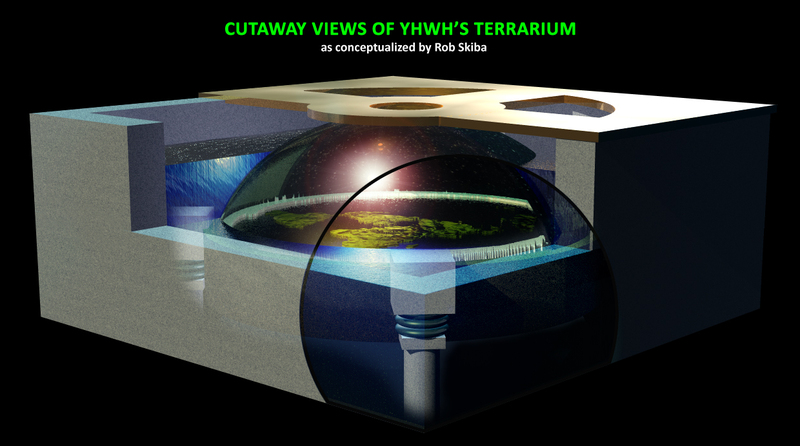 A creator that loves us would not put us on a ball spinning at 1000 miles an hour in outer space going around a sun, he loves us and would want to protect us and keep us safe and watch over us. Putting us on a spinning ball would be cruel, something Satan would do.